“We’re bringing the war, to you. Dumbest movie of the year. A sort of sequel to “Olympus Has Fallen” but this time the battlefield is moved to the UK. Especially to the metropolis of London. The same key figures were gathered again. 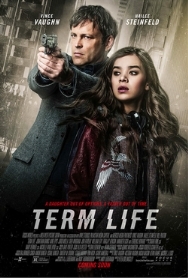 Aaron Eckhart plays again the role of US President Benjamin Asher who managed to survive a terrorist attack by overzealous North Koreans in the previous film. And this with the help of the disgraced secret agent Mike Banning (Gerard Butler). 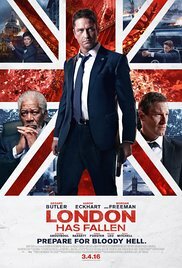 Morgan Freeman is back again to take over the President’s tasks as Vice President as soon as Asher ends up in an awkward position. This time it’s during the solemn funeral of the Prime Minister of England. The idea of Butler to hang his secret agent braces on the peg (as he’s about to become a father), is forgotten temporarily so that he can accompany the President to this state funeral. The moment the most important government leaders arrive for the ceremony at St Paul’s cathedral, all hell breaks loose. London is being reduced to a smoldering war zone where major known landmarks are transformed into ruins and twisted steel. Admittedly, it sometimes looks impressive and this chaotic situation is shown in a convincing way. But you can’t say that the special effects are very present-day. They look downright lousy sometimes. Especially the crash of the Presidential helicopter looked like crap. Don’t get me wrong. I really enjoy an action-soaked movie once and a while. Such an action movie where you have to put your brains on mute momentarily. But there’s a difference between mindless and entertaining action pulp and a plain utter dumb spectacle. When suddenly half of London throws off his disguise during the most secured ceremony and starts to kill every bystander (even a grenade launcher appeared from under a djellaba), this felt downright ridiculous. Maybe it’s suitable for raising the level of spectacle. But after the terrorist attacks we faced recent years, this was absolutely insulting. I can imagine that people who do their best while working for the national security, would be pissed and turn their back towards this film after seeing such an amateurish organization. To be honest, I thought “Olympus Has Fallen” had a bit of originality, although it shamelessly copied the “Die Hard” formula. But this film smells purely of commercial extortion. So they can exploit the moderate success of the previous one even more. Adding the sentimental topic of Banning’s pregnant wife and the wrenching dilemma Mike is facing, was a weak attempt to bring some variation. And don’t get me started about the cheesy dialogue and failed attempts to bring some humor. Only the parodies on some European government leaders (with a flirty Berlusconi as highlight), I could appreciate a bit. I’m just hoping there won’t be a group of insane morons who’ll use this film as a guide to try something similar anywhere in the world.